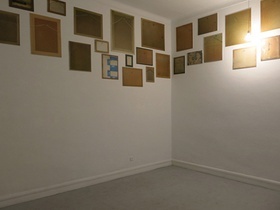 Georgia Kotretsos produced two projects during her one-month run as artist-in-residence at L’appartement22, in Rabat, Morocco, from December 2013 to January 2014. The first was a performance on the tree-lined medina in front of the capital’s parliament building on Mohamed V Avenue, entitled Spring Cleaning, a public performance produced by Kotrestos’ own collective Women With Talents (WWT), formed along with Athens-based artist Natasha Papadopoulou. 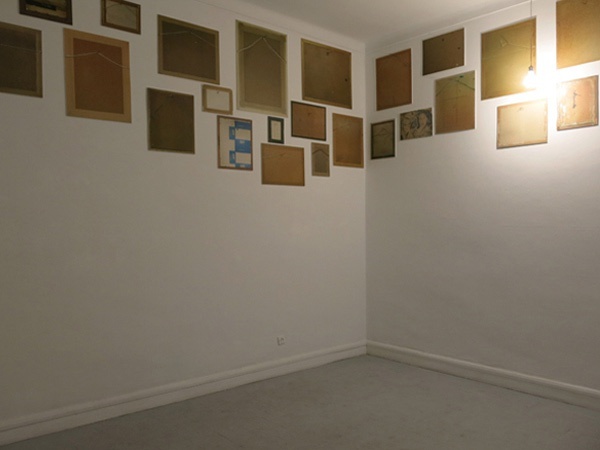 The second was a photography-based exhibition titled KARFI (Greek for ‘nail’: Kαρφί), produced specifically for L’appartement22, an independent space for contemporary art that organizes exhibitions, workshops, and residency programs (on show to 31 March 2014). Georgia Kotretsos, KARFI, 2013, installation shot. Courtesy of the artist and L’appartement22, Rabat. The public performance Spring Cleaning took place on Rabat’s busiest street Mohamed V and one of the most politically symbolic locations in the city – in front of parliament, where protests are routinely held to capture the attention of lawmakers inside. It was originally conceptualized with Athens’ Syntagma Square (Constitution Square) in mind, since the performance was created as a response to the Eurozone crisis and subsequent protests that have erupted as a result of it, which had hoped to catch momentum of the 2010/2011 Arab Uprisings. Thus, WWT adapted the performance to their Moroccan surroundings and the setting became the street and median in front of Morocco’s parliament rather than a square. They performed routine domestic chores in Rabat’s routine place of protest, highlighting the quality of protesting as a form commonplace daily labour. Moroccan artist Touda Bouanani joined in the performance. And, in addition to the word κάθαρσις (‘catharsis’ in Greek), they used large rolls of stencils to outline the word as-saha (‘health’ in Arabic) with white chalk. After brushing marble cleaner on the words, the artists fetched water from the public fountain in plastic buckets and washed the ground so that the words emerged brightly out of the dirt. The artists repeated this process for an entire day with various cleaning products, brushes, and buckets strewn about the scene. Due to the performance’s repetitiveness, it partly drew attention to women’s unseen daily labour by making art out of domestic chores – indeed grabbing the attention of casual passersby and police alike, with the latter stopping to ask for authorization a few times during the day. However, because this is the centre of protest par excellence in Rabat, the performance also did something else: it evoked the ant-like labour of civil disobedience. For long-standing protests of the unemployed in front of parliament, sometimes one can only think of it as a disruption of ordinary life (creating more traffic, bringing out more police and military, drawing crowds, and contributing additional noise), but the performance of protest itself gives visibility to the organization, the ordinary, routine work behind it: the smocks of different colours indicating different groups; the repetitive strategy of gathering and dispersal in rhythm with police presence and, sometimes, violence; the signs and banners unique to each group. Kotretsos’ own public performance in the same location only highlighted the project’s similarities to the protests – rendering invisible and repetitive labour visible. The critic John Berger once noted that demonstrations are staged disruptions of ordinary life, as well as potential ‘rehearsals’ for the more sustained upheavals of revolution. While protestors have performed the demand and reclamation of their rights to employment in the same location where Kotretsos performs the routine chores of domesticity, she leaves her own demands or desires after each repeated ‘rehearsal’: the words κάθαρσις (catharsis), and as-saha (health). At one point, after another ground washing, a woman walking by and jokingly said: ‘bil saha’ – an Arabic sentiment pronounced after one emerges from the hammam or bath, literally meaning ‘to your health’. Even though she was mockingly addressing the ground after its cleansing, it was exactly the sentiment Kotretsos’ group and performance wished upon the body politic-health, cleansing, and regeneration. With Kotretsos’ photography-based exhibit KARFI, she once again interrogated our way of seeing by engaging us in the invisible around us. 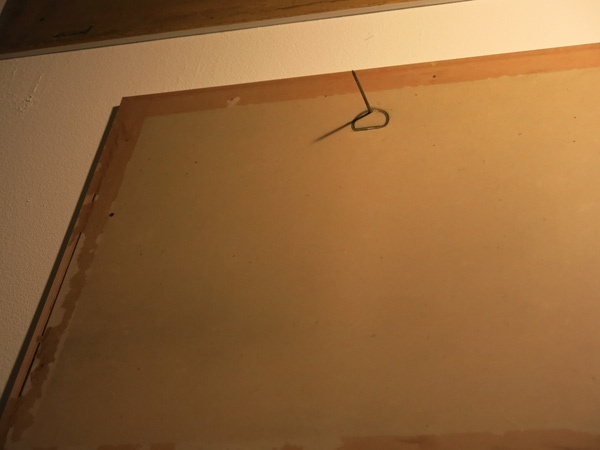 The title denotes ‘nail’ in Greek, but the artist’s programme indicates that ‘the word is also layered with metaphorical and playful connotations that draw attention to elements of our surroundings that otherwise would have escaped us.’ Upon entering the small space of L’appartement22, the sense of something being amiss accompanies appraisal of the pieces nailed high up on the wall – high enough so that some observers crane their necks, stand on tiptoe, and take in the nails jutting out of each piece. While her programme identifies that each piece is a photograph of the back of photographs taken in shops all over Rabat, it shies away from specifically identifying which photographs she chose, though each is actually the back of one of the Mohamed VI photo portraits that adorn the walls of shops, restaurants, and offices all over Rabat. Each photograph in the exhibit is nailed in alignment on the wall with its front-side counterpart – be it in a store or café – but nevertheless high up on the walls above any observer. 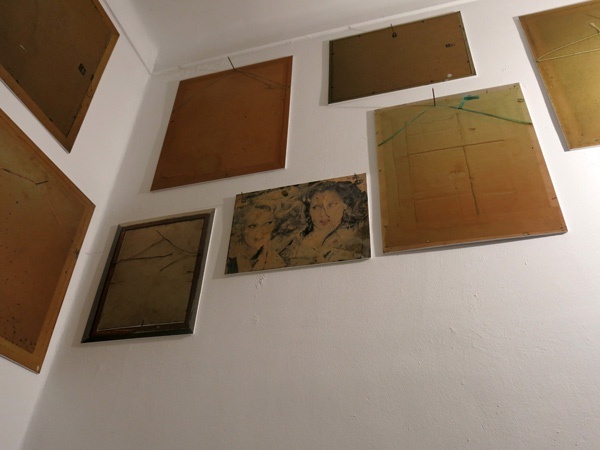 The photographs show mold, hanging thread, dirt, water damage, creases, even a faded picture of two women, possibly an old advertisement. With nails jutting out of each back portrait of a Mohamed VI photograph, the realization hits that observers of the exhibit are positioned as though peering at the image from both behind and inside the walls. Even for a moment, we are compelled to recognize our invisibility from behind the walls and simultaneously realize that it does not prevent us from continuing the labour of observing the photographs of the neglected and decaying ‘other’ side above our heads. From the performance to the exhibit, our ways of discerning labour and invisibility unravel so that we find ourselves on the outside looking in, realizing that each nail, in drawing ‘attention to elements of our surroundings that otherwise would have escaped us’, points toward us. Karfi is on show from 14 January to 31 March 2014. For more information visit:www.appartement22.com/spip.php?article361. John Berger, ‘The Nature of Mass Demonstrations’, International Socialism (1st series), No.34, Autumn 1968: 11-12. This entry was posted on February 27, 2014 by nahrain in .